The transoral approach provides the most direct access to pathologies located on the ventral side of the craniovertebral junction (CVJ). The CVJ comprises a bony channel formed by the foramen magnum, Atlas More Details, and axis that encloses the distal medulla oblongata, myelobulbar junction, and upper cervical cord. During the past half century, transoral odontoid resection followed by posterior fixation procedures has been accepted as a standard procedure to treat nonreducible basilar invagination. 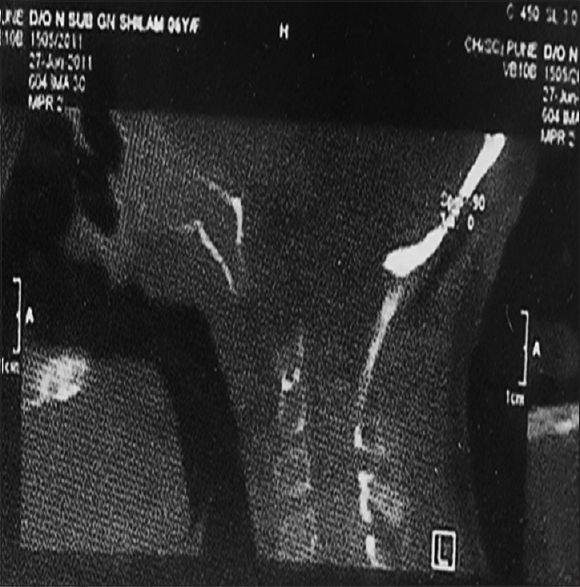 Decompression utilizing this technique has achieved a good neurological outcome in a majority of patients., Transoral anterior decompression along with anterior fusion of chronic irreducible C1–C2 joint with spinal cord compression has been suggested by Subin et al. in 1995. The removal of the dens and the cartilage of the articular surfaces of C1–C2 joint has also been advocated. We report the case of a 12-year-old girl with a basilar invagination and Chiari malformation More Details who underwent transoral odontoidectomy and posterior fixation at the age of 7 years with immediate, radiologically confirmed, successful decompression; but after 5 years, she again started having symptoms of basilar compression and upper cervical cord due to the regrowth of the odontoid process. A 12-year-old girl had torticollis since birth (neck tilted to the right side). At the age of 6 years, she started to have several episodes of fluid dysphagia, with no other history suggestive of lower cranial nerves palsy and spinal cord compression. Brain and cervical spine magnetic resonance imaging (MRI) and computed tomography (CT) scans showed a complex malformation at the CVJ: basilar invagination, partial assimilation of the anterior arch of the atlas with rotation on C2, and Chiari malformation with compression of the brain stem and of the upper cervical spinal cord [Figure 1]. Thus, a transoral microsurgical odontoidectomy and posterior fusion with lateral mass screw were done [Figure 2]. Postoperatively, the patient improved clinically and radiologically; also, there was reduction in syringohydromyelia. However, after 5 years of symptom free, she had multiple episodes of lower respiratory tract infection, gradually progressive quadriparesis, with rapid deteriorating clinical course (within 3 months) in the form of severe dysphagia, nasal regurgitation of fluids, hoarseness of voice, and recurrent episodes of pneumonia and become wheelchair-bound (Nurick Grade 5), and the patient was kept on ventilator. The MRI and CT of the brain and cervical showed a quite complete regeneration of the odontoid process and basilar invagination with cerebellar tonsils herniated 12 mm below foramen magnum syringohydromyelia – C2–C3 extending up to C5 with a symptomatic compression of the brainstem and upper cervical spinal cord [Figure 3]. 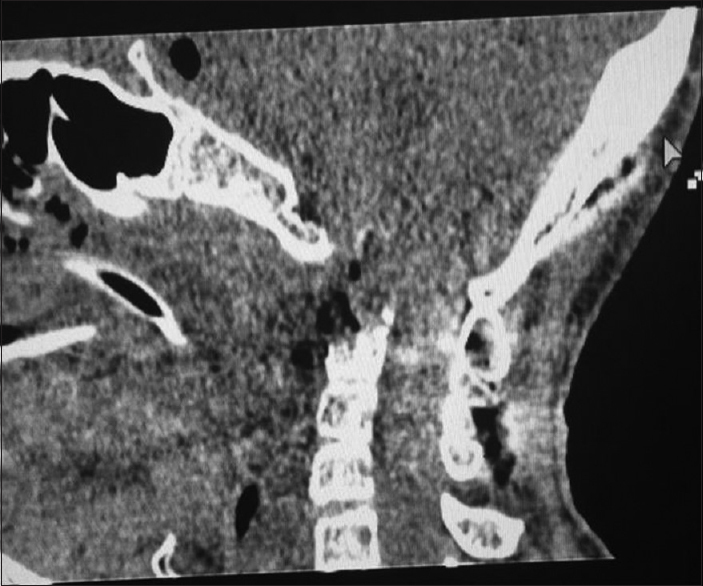 Hence, resurgery was planned, and the procedure done was right paramedian mandibular split procedure, transoral-transpharyngeal approach, and excision of anterior rim of FM, C1, anterior arch dens, and the upper part of C2 body [Figure 4]. Postsurgery, the patient improved quite well and started going to school with no lower cranial nerve symptoms. Transoral odontoidectomy is a worldwide diffused surgical procedure, and large case series of both adult and pediatric population harboring basilar invagination has been reported in the last decades.,, In 1997, Goel classified basilar invagination into two categories. In Group A, there is a fixed atlantoaxial dislocation, and the tip of odontoid process invaginates into the foramen magnum and above the Chamberlain line, the McRae line of the foramen magnum, and Thiebaut et al. 's clival line. In Group A patient, there is an element of instability of CVJ that is manifested by the tip of the odontoid process distancing itself from the anterior arch of the atlas or lower end of clivus. The standard form of treatment of Group A is transoral decompression and posterior occipitocervical fixation in the same sitting. Odontoid regrowth has never been reported in 12 years as a complication or an event after transoral odontoidectomy. Therefore, the above phenomenon can be related to or understand with the embryology of the CVJ. The odontoid process of C2 projects upward from the superior roof of the body and makes it different from the others. In the embryological developmental stages, C2 is formed from four bones separated by synchondrotical articulations and consisting of four ossification centers. (Two of them are located in the neural arches bilaterally, one of them is located in the body, and one is located in the odontoid process.) The borders of the odontoid process are well demarcated by these cartilaginous articulations during prenatal and postnatal development of C2 until the ending of ossification process. These cartilaginous articulations are named as dentocentral (separating odontoid from the body) and neurocentral synchondrosis (separating odontoid and body from neural arches). Synchondroses among the neural arches, body, and odontoid process fuse at 3–6 years of ages. After the age of 6 years, the odontoid process fuses with the body and the neural arches. In adult age, the remnant of the dentocentral synchondrosis can be imagined by the MRI as a hypointense ring between the inferior end of the odontoid and the superior roof of the body of C2. This structure is located in the cancellous bone and should be accepted as the inferior border of the odontoid process in adults. The anatomical level of dentocentral synchondrosis is well below from the superior articulating facets and the indentation of the transverse ligament to the posterior aspect of the odontoid process. According to the localization of the dentocentral synchondrosis, the odontoid segment may be divided into three segments. The first segment is the tip of odontoid. This segment is separated from the second segment of odontoid (the neck) by the apicodental synchondrosis. The neck of the odontoid process lies between the apicodental synchondrosis and level of the superior articulating facets. The third segment connects the neck to the body of C2 through the dentocentral synchondrosis and can be named as the base of the odontoid segment. This segment also fuses with the neural arches bilaterally. In our case, possibly, the initial odontoid resection did not include the dentocentral synchondrosis, which is generally well below the superior articulating facets that constitute the anatomical base of the odontoid process growth. Crockard HA. Transoral approach to intra/extradural tumors. In: Sekhar LN, Janecka I, editors. Surgery of Cranial Base Tumors. New York: Raven Press; 1993. p. 225-341. Dickman CA, Spetzler RF, Sonntag VK, editors. Surgery of the Craniovertebral Junction. New York: Thieme; 1998. Subin B, Liu JF, Marshall GJ, Huang HY, Ou JH, Xu GZ, et al. Transoral anterior decompression and fusion of chronic irreducible atlantoaxial dislocation with spinal cord compression. Spine (Phila Pa 1976) 1995;20:1233-40. Hsu W, Wolinsky JP, Gokaslan ZL, Sciubba DM. Transoral approaches to the cervical spine. Neurosurgery 2010;66:119-25. Fang HS, Ong GB. Direct anterior approach to the upper cervical spine. J Bone Joint Surg Am 1962;44:15886. Chamberlain WE. Basilar impression (Platybasia): A Bizarre developmental anomaly of the occipital bone and upper cervical spine with striking and misleading neurologic manifestations. Yale J Biol Med 1939;11:487-96. McRae DL. Bony abnormalities in the region of the foramen magnum: Correlation of the anatomic and neurologic findings. Acta radiol 1953;40:335-54. Thiebaut F, Wackenheim A, Vrousos C. New median sagittal pneumostratigraphical finding concerning the posterior fossa. J Radiol Electrol Med Nucl 1961;42:1-7. Goel A. Treatment of basilar invagination by atlanto axial joint distraction and direct lateral mass fixation. J Neurosurg Spine 2004;1:281-6. Garton HJ, Park P, Papadopoulos SM. Fracture dislocation of the neurocentral synchondroses of the axis. Case illustration. J Neurosurg 2002;96:350. Cokluk C, Aydin K, Rakunt C, Iyigun O, Onder A. The borders of the odontoid process of C2 in adults and in children including the estimation of odontoid/body ratio. Eur Spine J 2006;15:278-82.